Practical, compact hose reel to hang on the wall to always keep the hose tidy and handy. Made in sturdy plastic material and equipped with compartments to hang lances, couplings or other watering accessories. The black colour pairs nicely with any wall. 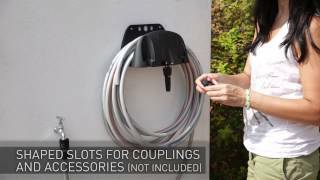 Eco 0 wall hanger for hose. Reinforced grooves prevent change in form. Hooking up hose and handgrip.